Face the evils of Jigoku and discover the dark fate of the Hiruma family. When a group of samurai pursue a dangerous master of blood magic to the ruins of Daylight Castle, they discover a secret that could redeem or stain the honour of the Hiruma family forever. The samurai must overcome threats to both body and soul if they are to halt a wicked plot that could bring about the doom of the Empire. Take your players into the foreboding Shadowlands with Mask of the Oni. 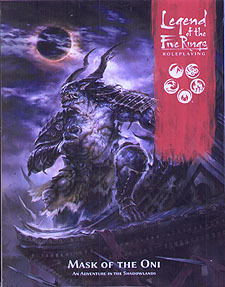 This adventure for the Legend of the Five Rings Roleplaying Game pits heroes against the dangers of the Shadowlands and the horrors found within the crumbling walls of the Hiruma family's fallen castle. A double-sided fold-out poster map depicting the lands of the Crab Clan, the Shadowlands, and the ruins of Daylight Castle.